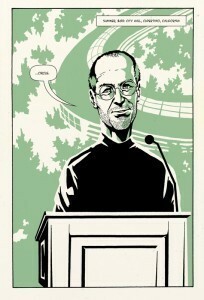 IR interviewed Bruce Upbin, managing editor at Forbes, about their graphic novel, "The Zen of Steve Jobs," a few days before Mr. Jobs's passing. While the full book, in digital release, won't be available until late this fall, we felt now might be a good time to let you in on its impending arrival. AHE: Can you explain how the idea for the book originated? BU: Way back in May I had lunch in the Village at a place near Forbes with Jesse Thomas and Leslie Bradshaw, the two main principals at JESS3, the design firm you probably already know about. We were throwing around ideas for ways to work together, infographics and that kind of thing. We were also talking about Steve Jobs, how sick he was and ways that media sites and publishers would go about doing obituaries and honorary pieces in the press. We talked about the challenge of coming up with ways to do it differently. Jesse mentioned he had always been fascinated with the time in Steve Jobs' life after Jobs had been fired from Apple (1986) and went off to Japan to study with the Buddhist monks. 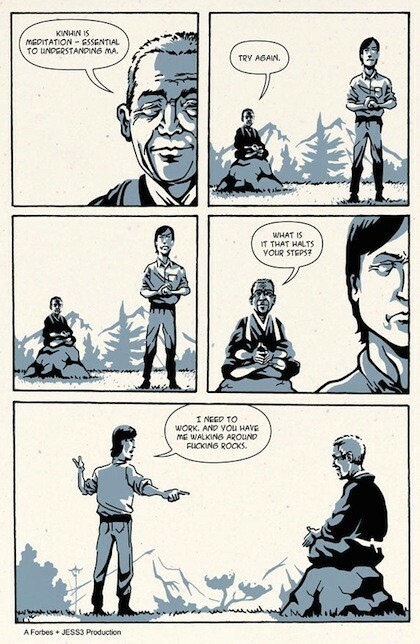 We also thought that would make a cool comic book, a zen ninja re-imagining of Jobs in the wilderness between stints at the company he founded and loved. I started obsessing about the idea, figuring out how a traditional [magazine] publisher like Forbes could get this done. First thing I needed was a script. When I got back from that lunch I started talking to Caleb about it. He was an intern just arrived from Northwestern on a Steamboat fellowship for promising students. It turned out he was a pretty big comics fan and Apple fan. He also was a damn good writer (which I didn't know at the time) and as an intern he had plenty of time on his hands. So I asked him to start researching this period of Jobs life to find out if Jesse's depiction of things was even accurate (it wasn't but the truth was even more interesting). I asked him to write a sample scene from this period. Then I talked my boss into letting us proceed with this with a reasonable budget. By early June we were on the phone with JESS3 to talk about how to proceed with a graphic novel that Caleb was going to write and they were going to illustrate. AHE: Did you know in advance that you wanted to do a graphic novel? BU: Nope. We had only planned a more traditional Jobs obituary package that would be ready to go when he dies. We're still doing that, but now we also have this comic. AHE: How did you decide on the contributors (Caleb as writer and JESS3 for illustration)? BU: Caleb's involvement is explained above. I had to give the job to JESS3 because it was Jesse's idea to start with. I considered the possibility of giving the design work to Forbes' web/print design consultants, a firm called Athletics. They were open to the idea and had some nice ideas about how to execute the story (possibly a hard-cover keepsake, more of a chapbook with lots more text than illustrations but the illustrations they would make would be stunning). But I decided to go with a more traditional graphic novel approach. AHE: What made you/Forbes decide to publish the book yourselves? BU: We're a publisher. Who else would do it? We are coming out with this first as a digital comic and are talking to the major comics platforms like Comixology and Graphicly. I like the idea of selling this comic for $8.99 or so via an existing digital distribution partner versus trying to sell this as a free-standing app or ebook. We already have the magazines's distributor for the printed version, which will come out sometime after the digital edition. You'll be able to get it at Barnes & Noble and newsstands for something like $10. AHE: What's the timing for publishing (I read "a print version of the book will be featured in Forbes' upcoming Forbes 400 issue and a digital version of the book is slated for release in the late fall")? BU: I hope to get it out a couple of weeks before Thanksgiving. AHE: Do you plan to make the print version available via other outlets besides Forbes 400? Do you plan to offer the book for sale as a stand-alone? AHE: Do you have any expectations for the book sales-wise? BU: Fingers crossed, we'll more than make our money back. Based on the great feedback we've had on our Facebook wall and on Twitter, we should do as well as top-selling comics or graphic novels. I don't have any sales figures for top-selling digital comics but printed ones can do north of 30,000 or 60,000. AHE: Does Forbes have any other indie books in the pipeline? BU: Not right now. Do you have any cool ideas we could pursue? AHE: Not at the moment. But if any of you, our readers, have ideas you think Forbes might be interested in, please forward them to me at IR. Who knows? Thanks for your time, Bruce! We look forward to seeing the book.